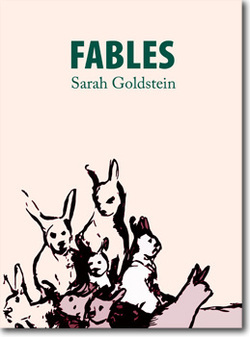 Sarah Goldstein’s first book, Fables (Tarpaulin Sky Press) defies easy categorization. Marketed as “fiction,” Fables is formatted into five sections, each featuring short, numbered blocks of prose that depict a scene or relate a story in the fashion of Aesop. However, like Aesop, Golstein’s “fables” can just as easily be taken as (prose-) poems, each one containing a pronounced, concentrated rhythm and featuring familiar and strange images, while lacking proper nouns and specificity. Another thing lacking from these fables is a moral or encapsulating final phrase—something that comments on the preceding action. In the case of Fables, the minimal commentary renders these dark fables vague and cryptic. If there is a lesson to be learned amid the catastrophic misfortunes befalling the characters in these fables, human and animal alike, that lesson is found solely within the reader’s analysis. For instance, in the very first piece in the section entitled “Fables,” Goldstein seems to bring in the very question of narrative, which is to explicate a series of events beyond simply ordering them into a digestible sequence. When a group of adults bring with them grief-stricken orphans on their next hunt (they heed an old myth: “take an orphan child hunting, you will return with threefold the bounty” [author’s italics]), the orphans vanish mysteriously from their party and the hunters return empty-handed. According to the fable, the children depart from the party, sensing the adults’ frustration, and wind up falling asleep in the underbrush of the forest, only to awake as birds: “When they cry, it is the sounds of the whippoorwills. The nightingales become their mothers, and pheasants usher them to winter quarters” (7). When the adults return to face the other villagers, “[everyone] grimaces, hearing only what they decide to understand” (7). There’s no clear alternative interpretation of the events that Goldstein presents to us. The children disappear and turn into birds. Birds and transformations figure greatly throughout this collection as recurring motifs, enabling these fables to feel interconnected, despite each one being both microcosmic and singular, without repeated characters or settings, yet still managing to recall Greek and Western European storytelling tradition. In the instance of this fable, Goldstein affords her readers the freedom to “decide to understand” what they read or how they read into Fables. Rimbaud, in his famous prose poem, “Conte” (“Story”), utilizes then brutalizes the familiar fable form, depicting a restless prince who savagely slaughters his subjects, who in turn mysteriously emerge unharmed and compliant. “Conte” ends with a cryptic encapsulating sentence that has nothing to do with the preceding text. This is to illustrate that what Goldstein does with the fable, by reinvigorating or reinventing (or even calling attention to the form and structure of the fable) isn’t entirely new or untried—think: Donald Barthelme and many of his numerous narrative experiments here. However, Goldstein writes with the air of someone who simultaneously knows what she’s doing while not obsessing with encrypting or disclosing meaning. Fables is no flagrant assault on any literary movement, but a very poised, playful, and unpretentious collection of proses that challenges readers’ notions of what is a fable and to whom is the fable directed. The “you” may be taken in the figurative sense; however, would it not be more delightful and insidious to assume we bear witness to this violent aftermath which despite its vividness (deciphered, clattering limbs and a road compared to a hallway of sawing, creaking doors) is still quite puzzling? Goldstein infers the driver has hit a tree, whose shape has left an indent in his windshield. Another way we could interpret this—this, with its free associations!—is that gendered tree is in fact a woman, shuddering along the roadside as the man who hit her with his car is obliterating the evidence. Again, no comment illuminates or firmly directs our thinking, which is refreshing to say the least. Perhaps one of Goldstein’s greatest achievements in this slim, provocative (and beautifully designed) collection of proses is her consistent, dark and at times terrifying tone (terror as suggestive; horror as explicit—according to Anne Radcliffe’s “On the Supernatural in Poetry”), sustained through a consistent pattern of narration—no exposition, a sequence of action with or without a climax, and overshadowed by dodgy yet curiously vivid, heavily auditory-based depictions. Goldstein’s tone, along with these violent, intelligent, and suggestive yet playful and inventive little stories make Fables an outstanding candidate for any poetry/prose lover’s bookshelf.